Sorry for the obvious copypasta in this one. It was kind of necessary though. I’ll try to stay away from that as much as I can in the future, but it’s hard because it’s just so damn convenient. So, anyway. 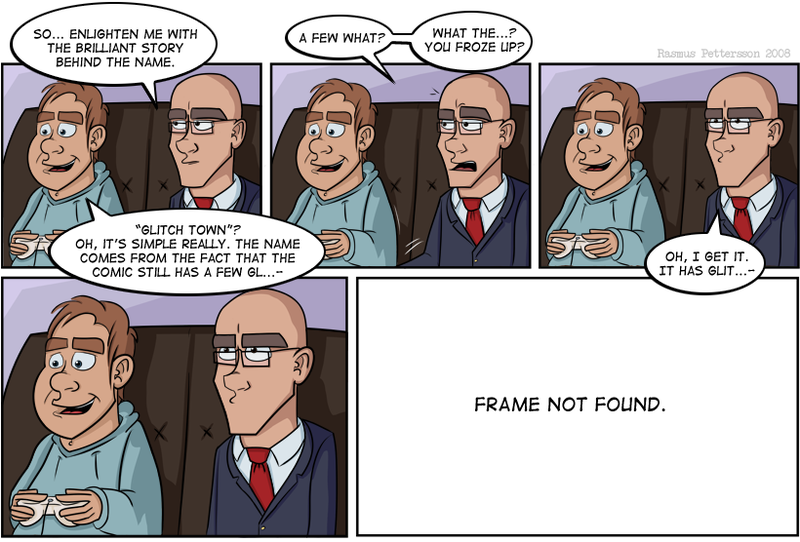 There’s still a few glitches – errors – in the comic, hence the name. Hence the funny. Like I said before that I’d do, I’ve practiced drawing the characters, Isaac and Leslie (that’s their names, haven’t reviled that yet. Although… I just did), some, and I think the art in this one’s much better than the two first. I’m almost satisfied; the only thing I’m annoyed at is Leslies (to the left) hands and the controller. I can’t draw hands. Obviously, I can’t draw controllers either. Needz 2 prakiz taht sum. Also, changed the color of Leslies hoodie. Last but not least: Read the latest news, please. I’m changing the update to Monday. This entry was posted on Sunday, March 23rd, 2008 at 3:13 pm and is filed under Comic. You can follow any responses to this entry through the RSS 2.0 feed. Both comments and pings are currently closed.